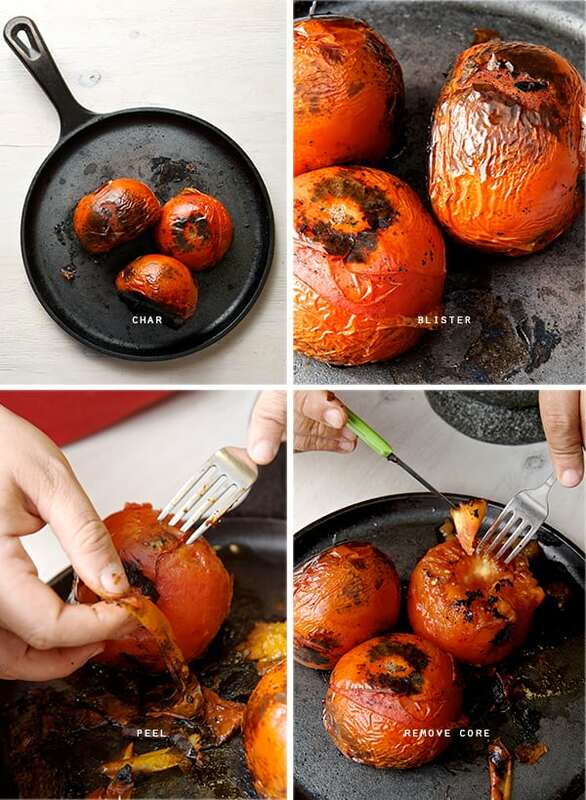 This recipe is one from our grill. It was inspired by that fire kiss char flavor one gets from cooking over coals. Francis Mallmann, one of my culinary heroes, discovered his true culinary craft in his birthplace, Argentina. He embraced his roots, and cooks from the primal force: Fire. Taming this element is what he does best, his instincts and knowledge based on French disciplinary techniques gives him the perfect alibi to be one with fire. It’s his passion, intuition, and adventurousness that make him the king of char. I had the opportunity to meet him at the presentation of his book “Seven Fires” here in Austin, Texas. Its a cookbook I can recommend to anyone who wants to explore and understand open fire cooking. It wasn’t until I tried his technique on my own little grill that I experienced Mallmann’s big flavor world. 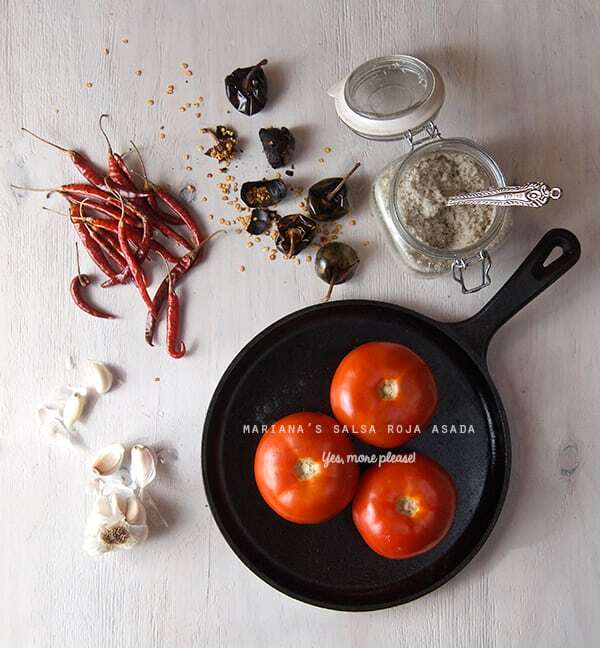 Besides discovering and loving the char flavor, one of my favorite recipes from his book is the Chimichurri. 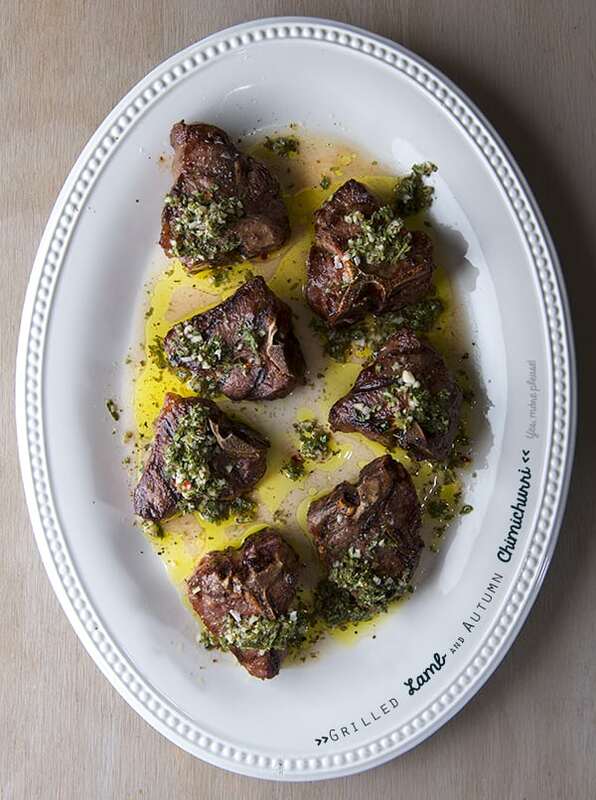 It is made, gaucho style with fresh herbs married to the extra virgin olive oil and a salt solution called salmuera. This kind of chimichurri is not the one that resembles pesto, the herbs are finely chopped transforming the oil and brine into a magical loose herbed infusion in which you can taste all the herbs in harmony and discord at the same time. 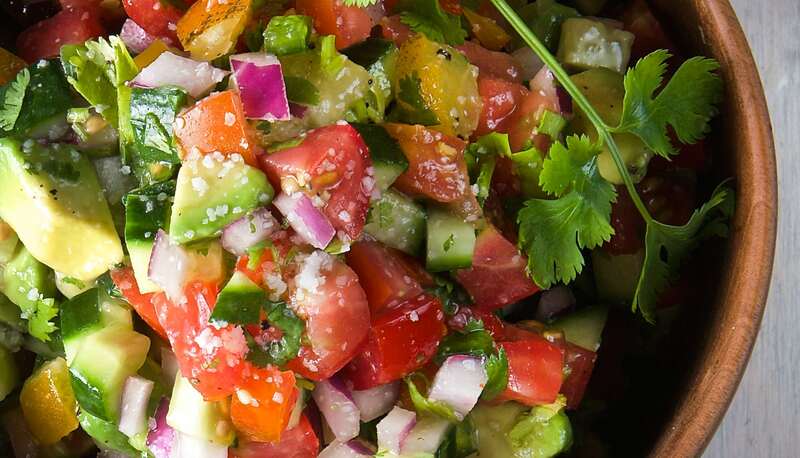 Besides the recipe which is so easy to make, I would love to share with you a few of my tips when making Fresh chopped Salsa fresca, mostly known here in USA as “Pico de Gallo”. Enjoy! Everything has to begin with a sharp knife. Nothing ruins good salsa more than a dull knife. 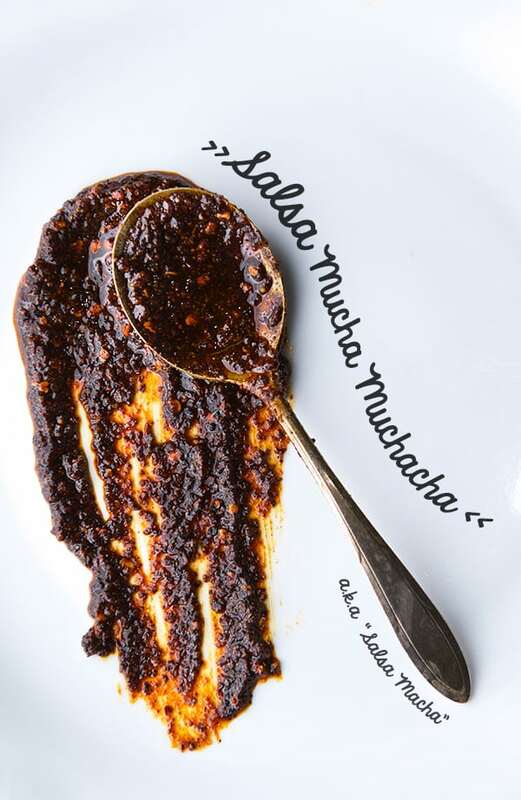 Mushy cuts do not make a salsa very appealing and ruins the texture. So, sharpen those blades, baby! Mix them up! Juliet, Cherry tomatoes, Sun golds, Lemon Boy, Roma, Heirloom, right now is the right season were there is plenty tomato goodness to choose from. My favorite Tomatoes in Austin, TX are the ones that Boggy Creek Farms produce. Click here to visit this beutiful Austin Urban Farm is one of the best. English cucumber, or Jade are my favorite since they don’t have to many seeds, thin skin, they keep their crispy texture when marinated. Red onions are sharp in flavor. My advice is after dicing the onions give them a quick rinse, drain them and add them to your salsa. Rinsing them will make them milder by washing away that milky pungent liquid. You, your loved ones and your guests will appreciate the little extra care! This kind is the creamiest of all avocados. They have a fleshier inside and small oval pit. Choose the ones that are firmer to the touch it should feel like well done steak. 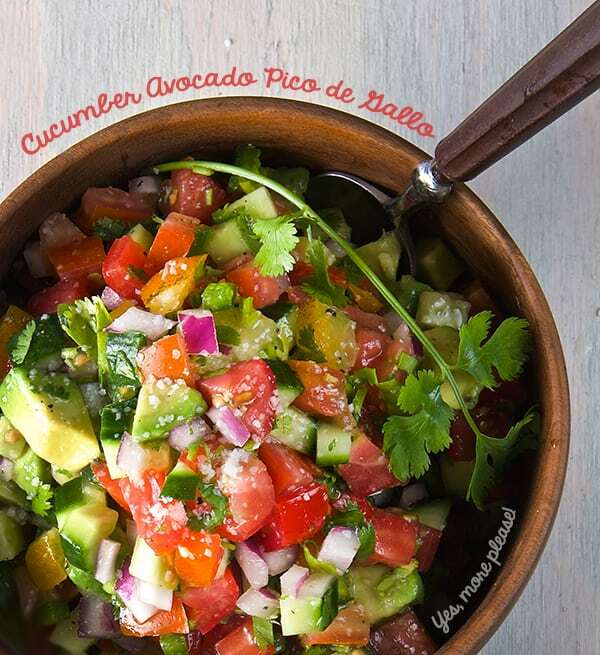 These level of ripeness will hold better in this kind of salsa-guac, creamy, not mushy. 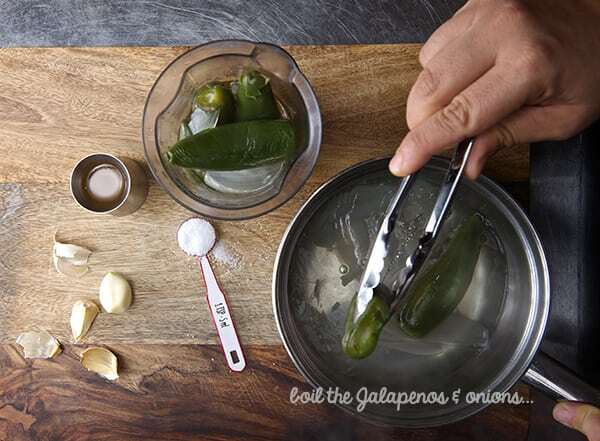 Rub a bit of cooking oil in your hands before cutting a jalapeño, this will protect your hands from the spicy burn. 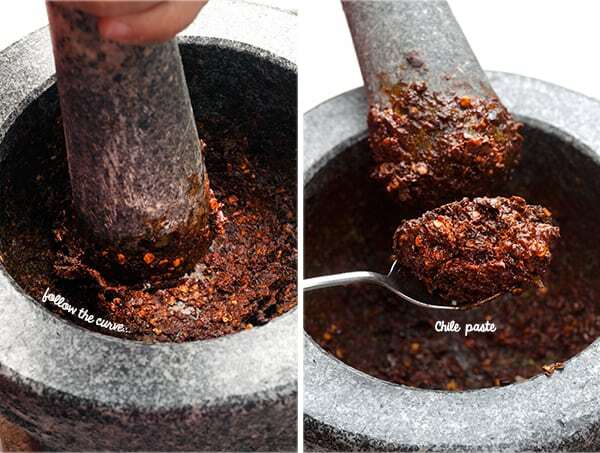 Remove seeds and vein or leave them up to how spicy you want it! Use limes, instead of lemons. They have a sharper acidity that balances great with the sweetness from the tomatoes. Why Sea salt instead of Kosher? 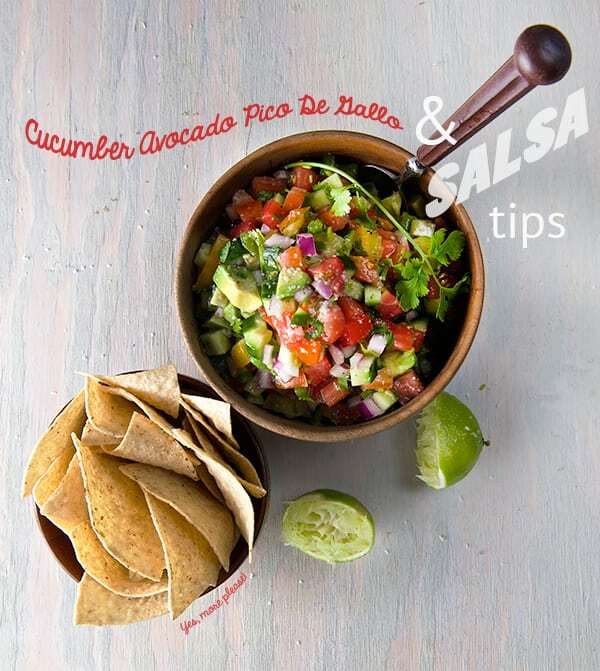 It tastes fresher and the salt crystals brighten up the salsa flavor. You can add other fresh fruit if you feel adventurous like Mangos, Strawberries, Green papaya, Pinneapple, Jicama, Peaches, the world is your canvas! 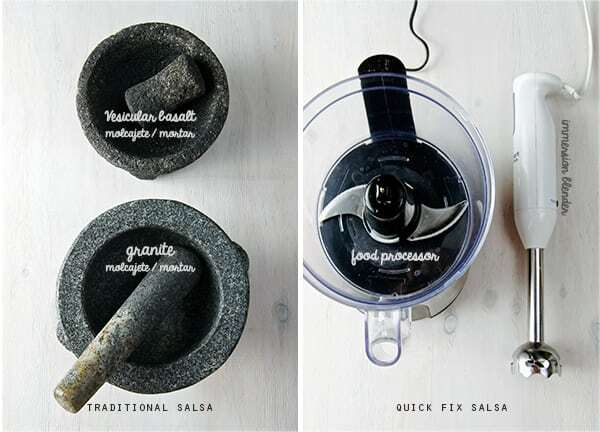 I hope these simple tips help you to get inspired and give a refresh spin to your salsa. 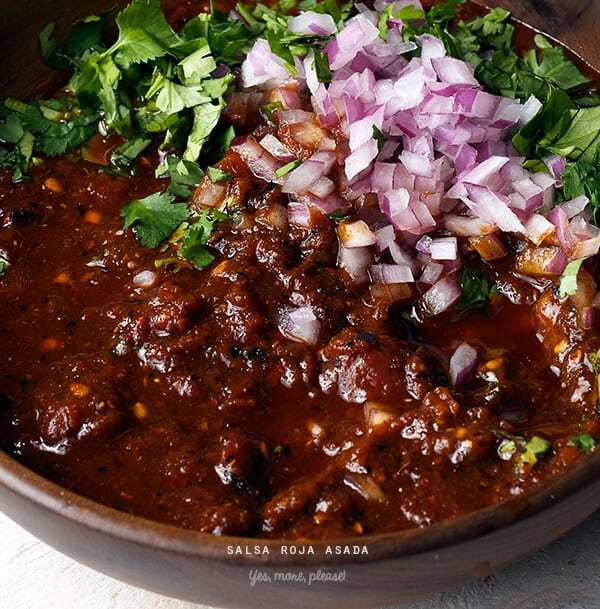 Do you have any tips when making salsa? I will love to read about them. Share them here and shoot us a comment! Relax and have a great weekend! Makes 1, 2, 3 or 4 people dance! 2 cups diced fresh tomatoes of your choice, check out my tips above. 1-2 jalapeños small diced one with seeds one with out. Corn Chips… lots of them! 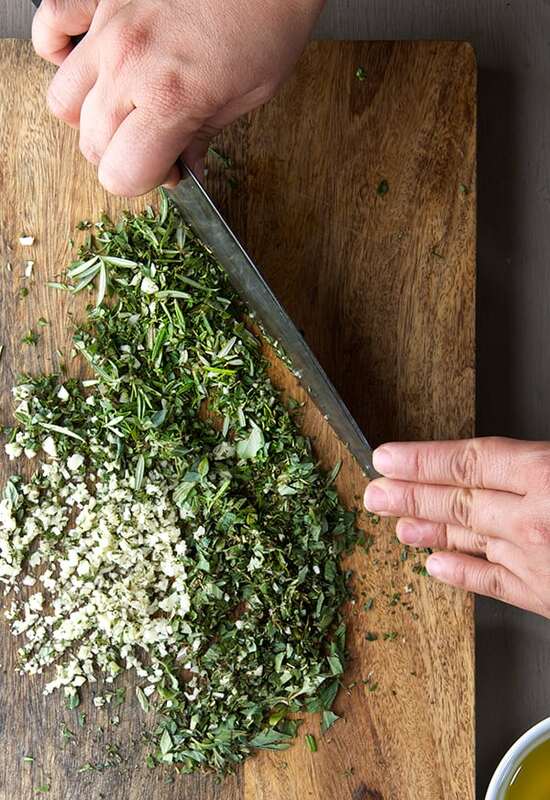 In a large bowl combine all the chopped ingredients, season with salt and add the oregano by rubbing between your fingers like if you where to snap the oregano at it. 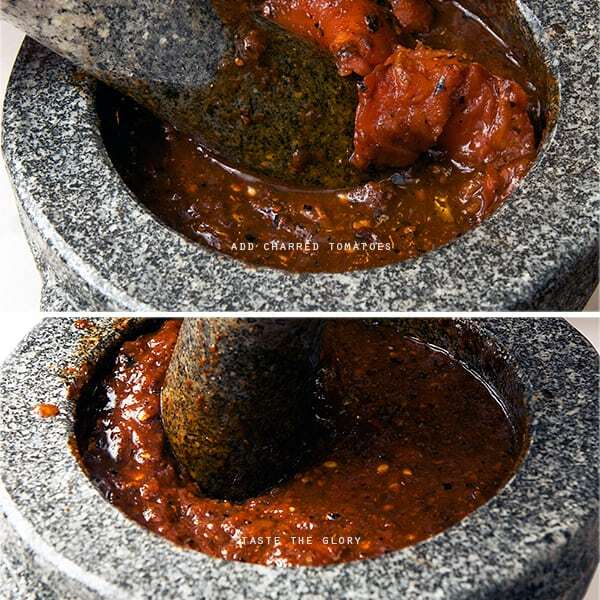 This warms up the herb and makes it into smaller pieces which flavors the salsa better. 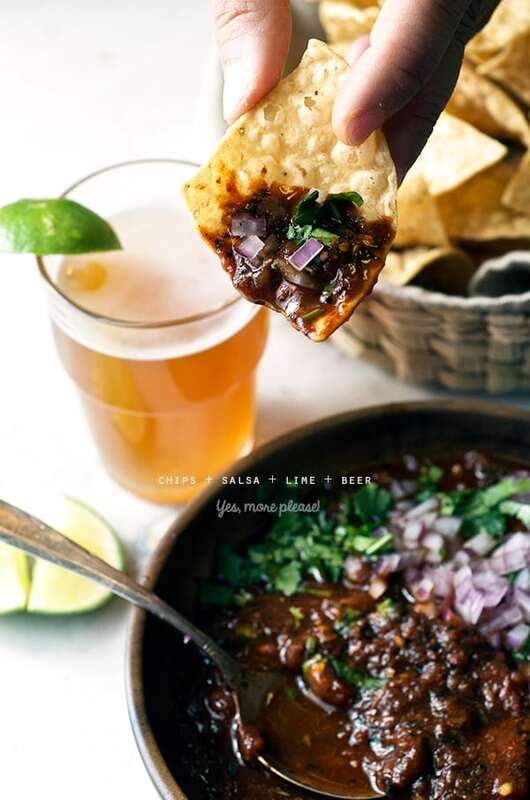 Add the lime juice toss and serve with corn chips and your fabulous Texas Caipirinha like this on the side…Enjoy! Have a great Memorial weekend, and enjoy the simple pleasures! 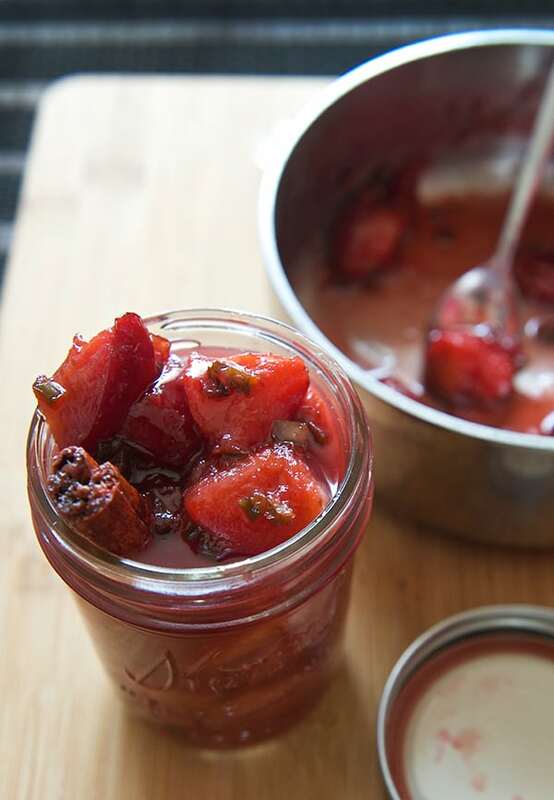 Make this Red Plum-Ginger-Jalapeño Chutney, put it on your pocket, take a road trip, place it on your basket of goodies along with cheese and crackers, snack, rest, repeat…Enjoy! 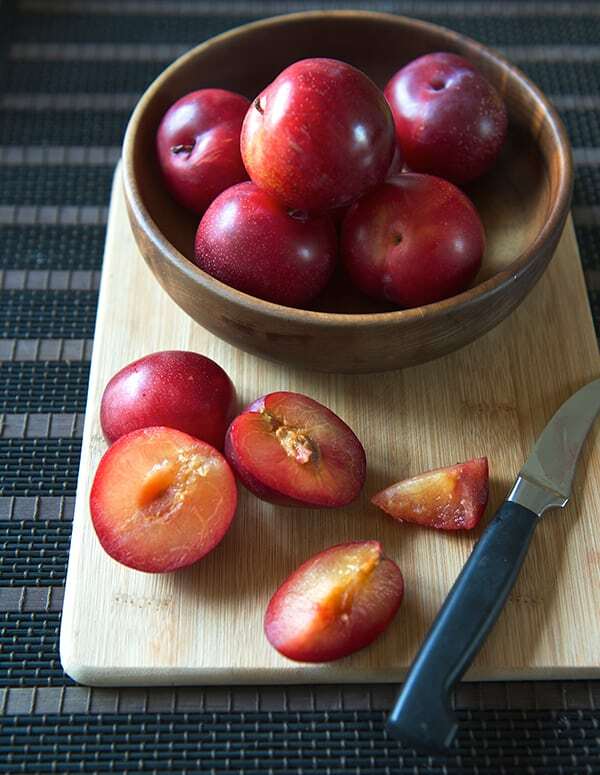 8-12 ripe Red plums pitted and cut in quarters and eights. 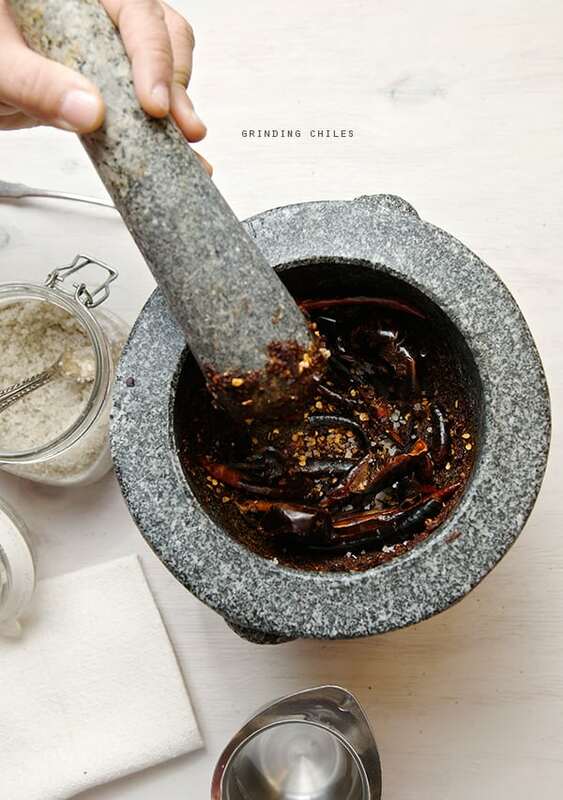 A dash of ground clove. 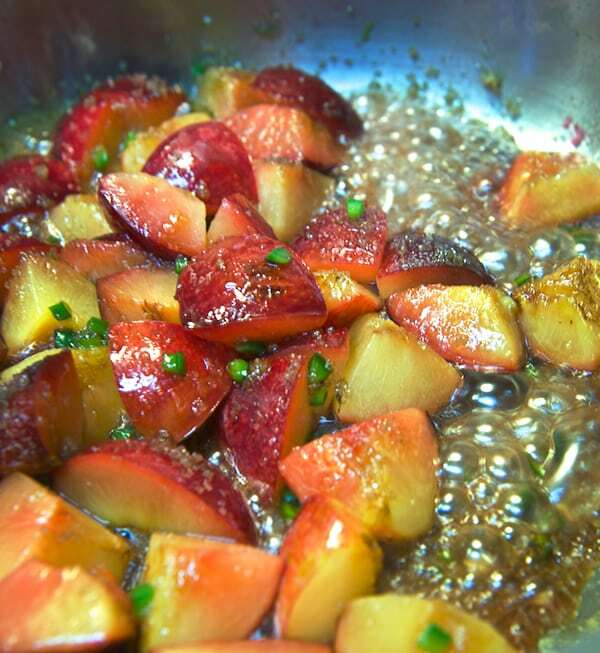 Over medium high heat in a stainless steel pan place the plums, sugar, honey and cinnamon stick. Let the plums warm trough about 4-5 minutes. Once that the sugar and honey start looking bubbly, add the grated ginger, diced jalapeno, cider vinegar, olive oil and the dash of clove. 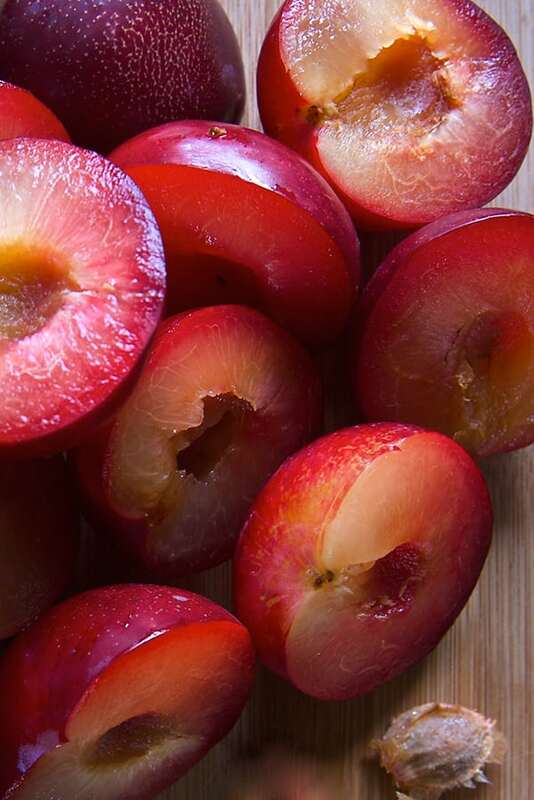 Let simmer for about 5-6 minutes, until the juices look translucent and some of the plums have started to get soft and you can smash them easily with a spoon. Turn off the heat and set aside. 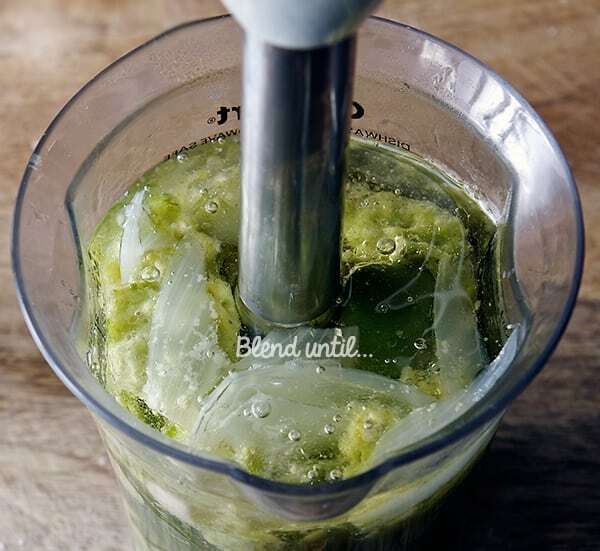 Keep on a glass jar, refrigerate after cooling down, it lasts for 1 week in the refrigerator… if you are lucky! at the Farmers Markets here in Austin, Tx! 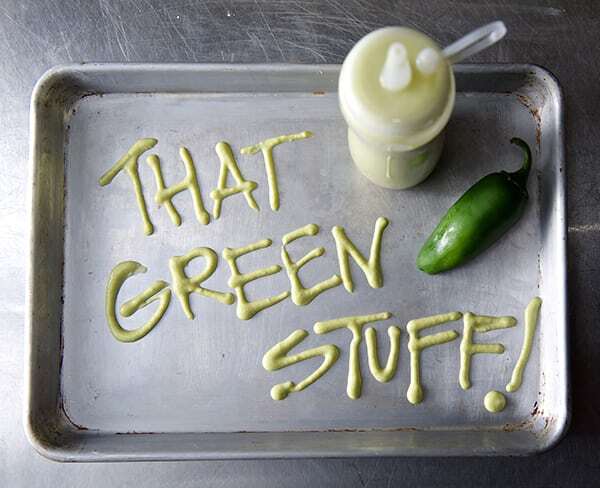 I know you’ve seen and tasted this creamy, spicy, light green sauce at taco stands, Mexican and Tex Mex restaurants here in Texas. This creamy green sauce is incredibly good and addictive. It’s tangy and spicy profile is irresistible. Why “green stuff” ? Its ingredients are a mystery when you taste it. 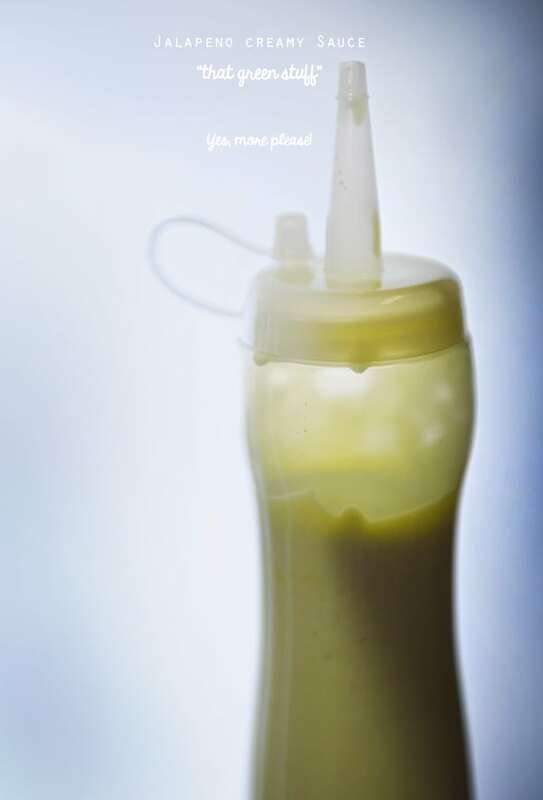 The creamy texture makes you believe it has avocado or maybe some sort of cream or mayonnaise. I’ve tried to make this sauce many times with no success, until now. I even tried to buy this sauce at a super market chain here in Austin that started to sell it. After trying this supermarket version with its whopping thirty-one ingredients which did not even taste or resemble the creamy tangy spicy “green stuff sauce”. Determined to make my own, I decided to take action and start my research. 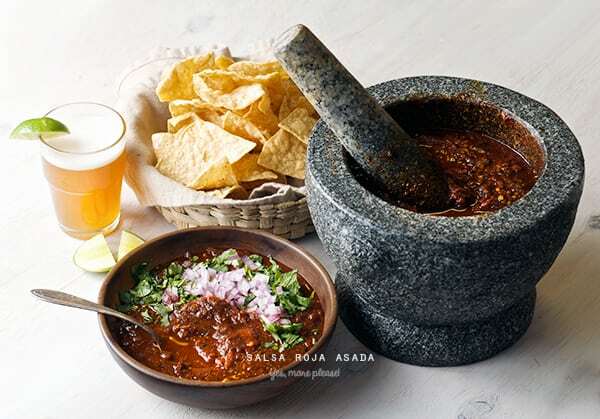 This traditional Mexican salsa was not easy to figure out, although I had sampled it many times in my life in Mexico, a very common condiment for tacos, and street food. My first encounter with this sauce was in Baja at a fish taco stand. I experimented with 3 or 4 recipes that I was given by different taco stands and restaurants. I had to eat a lot of tacos in order to get the flavors and ingredients correct or to even attempt to ask how it was made. Such are the sacrifices I make for my readers…Oh well. After asking a few different sources, I learned the principle of how the creamy sauce was made and to my shock and surprise I discovered that this green creamy sauce is made with just five ingredients! Not a single drop of dairy, cream or avocado is used. Now my mission was figuring out the amounts. It knew it was going to be a matter of trial and error. 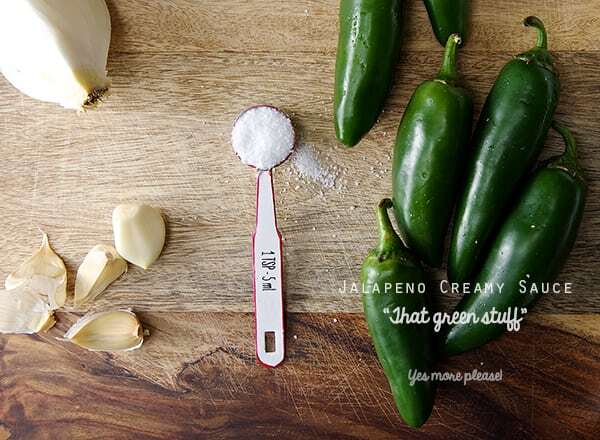 I started to play with the five ingredients: Fresh Jalapenos, Onion, Garlic, Corn Oil and Salt . I combined them in the most sensible way possible. I attempted to recreate the recipe about three or four times by adjusting the spicy and creamy taste I had in my memory. 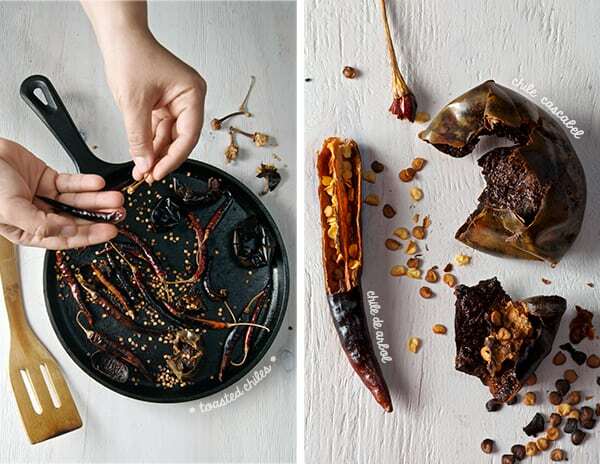 I tried different methods like roasting, pan frying, blistering, and boiling the chiles as referenced by my sources. Finally on the final attempt I got it! The green creamy sauce is here before your eyes and I’m sharing it with you with no edits. 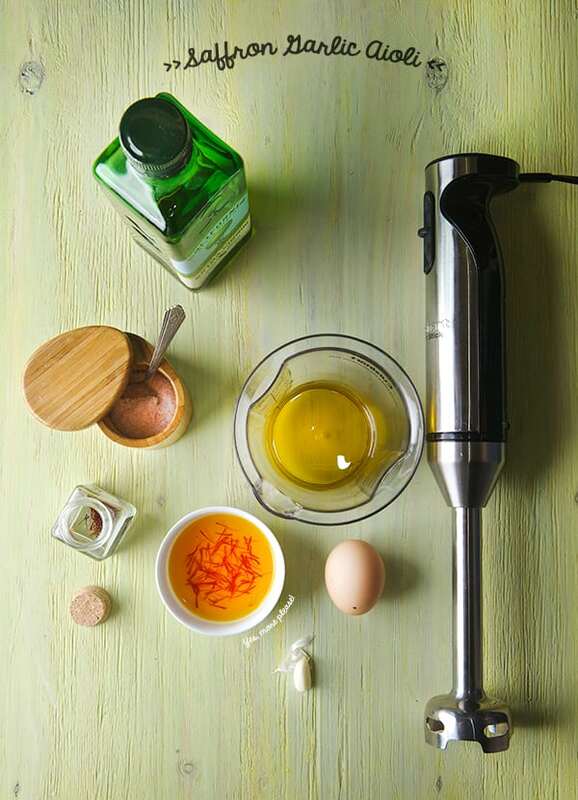 Easy as 1-2-3-4 steps and five ingredients. 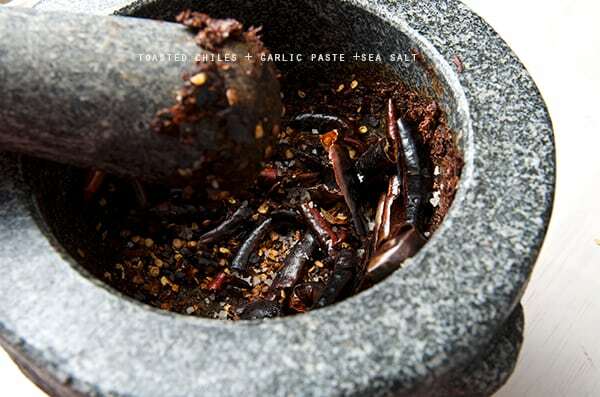 You can make this epic sauce for a fraction of the cost and a thousand times greater in flavor in a blink of an eye. Bettter news yet, it is good for all my Vegan friends, because there is not a single drop of dairy in it. What can you use this sauce on? 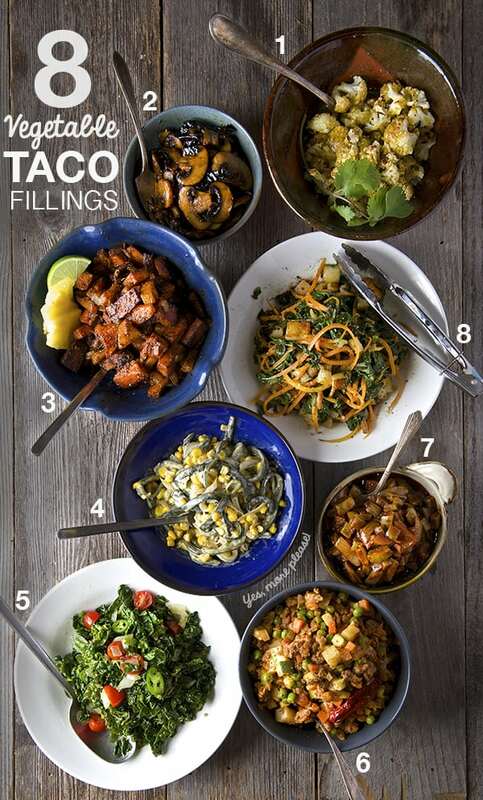 EVERYTHING, from ANY taco(on fish tacos..amazing! ), carne asada, fish, pork, lamb, roasted chicken, tofu, quesadillas, eggs, sandwiches, burgers, chips, roasted veggies, BAKED SWEET POTATOE FRIES (did I said, baked sweet potato fries? 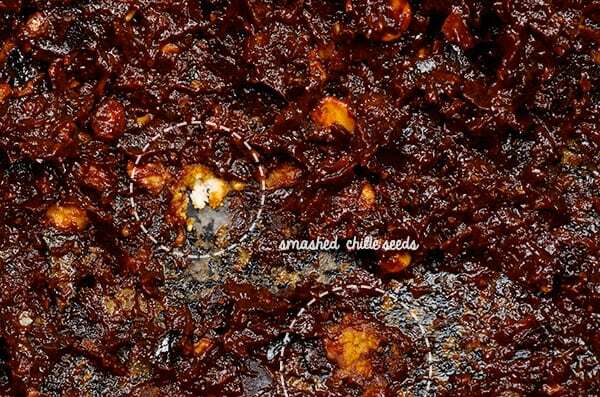 ), roasted potatoes, pizza, hot-dogs, you can even combine this sauce with some sour cream and transform it into a dip for chips.. you name it. Go wild!…I’m in total love with it and so glad I can share it with you. I hope you fall for it too! Makes about 2 – 2-1/2 cups. 6 large fresh Jalapeño chiles. Mine weighed about 7 oz / 200 gr. give it or take.. you can make it half a pound why not! 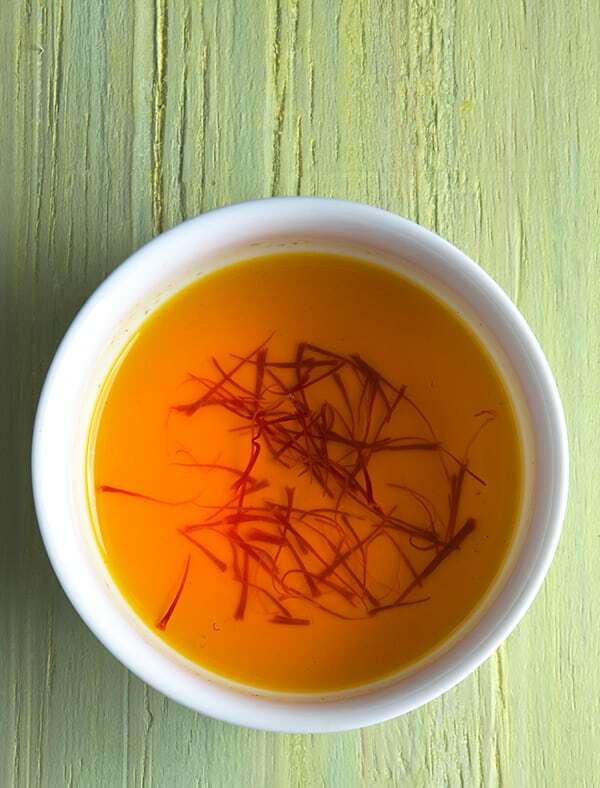 ½ to 3/4 of a cup corn oil, grapeseed oil, sunflower oil or extra virgin olive oil, or a combination of two. Note: depending on how spicy are your chiles, adjust using a little splash of apple cider vinegar to brighten up the flavor. Remember you can use any other chile you prefer, like Serranos, Poblanos, Habaneros, Bell peppers, Anaheims, Gueros, California, Hatch… or a combination of them! 1. In a small pot bring water to a boil, enough water to cover the chiles and piece of onion. Simmer the jalapenos and onions for about 15-20 minutes until they change in color and are fork tender, but not mushy. Carfuly remove stems after they cool down a bit and strain some of the excess water. 2. 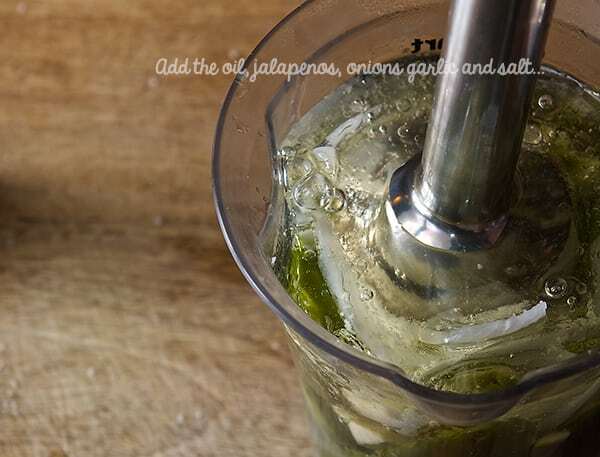 Using an immersion blender, a food processor or a regular blender, combine the corn oil, garlic cloves, strained jalapeños onions and salt. 3. 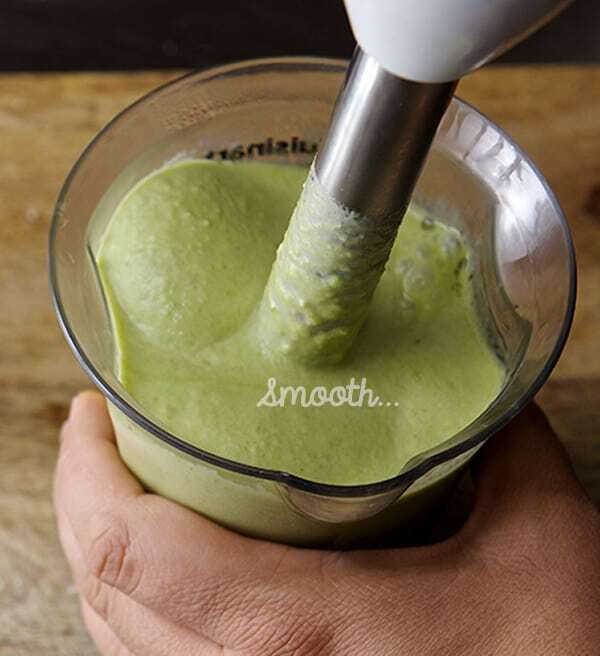 Blend until smooth and creamy, about 3-4 minutes using an inversion blender, about 5-6 minutes on a blender or food processor, until it looks frothy, creamy and pale green. 4. Taste for salt, adjust if necessary. Transfer to a squeeze bottle, and refrigerate. It will last for about a week… If you can contain your self!…. Enjoy! *This sauce is really spicy when is warm. Please, do not panic, once the sauce cools down and its refrigerated, the extra spiciness will settle and will have a comfortable mild bright spicy flavor. **If sauce is to thick add bit of the water in which the jalapeños were cooked, or a dash of apple cider vinegar. It always its more lose when recently made, once its refrigerated it tends to congeal, just give it a couple of nice shakes and it will be alright. Keep in the refrigerator. It last about 2 weeks… if you are lucky! 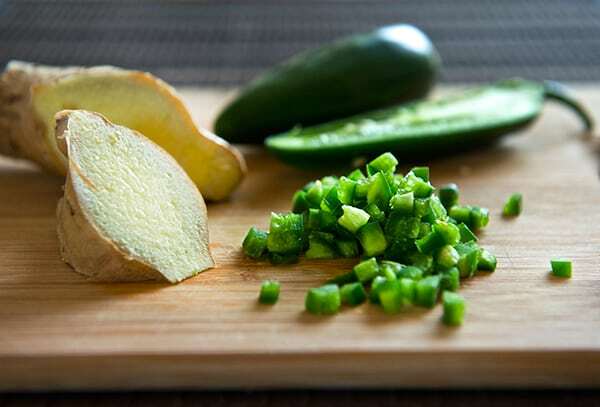 Substitute 3 jalapeños for 1 large or 2 small poblano peppers, remove seeds and veins. Add a teaspoon of apple cider vinegar to brighten up the flavor. Blend, Enjoy! ***Depending on how spicy are your chiles, adjust using a little splash of apple cider vinegar to brighten up the flavor. Remember you can use any other chiles you prefer, like Serranos, Poblanos, Habaneros, Bell peppers, Anaheims, Gueros, California, Hatch… or a combination of them!